Obed Ankomah Gyimah was born to Mr. James Ankomah and Mrs. Comfort Ankomah on the 24th day of October, 1992. He hails from Nkoranza in the Bono East Region of Ghana, but currently resides in Agona Swedru. He had his Primary, Junior High and Senior High education at the Greenfield Schools at Agona Swedru, St. John�s Junior High and Breman Asikumah Senior High school respectively. He had his tertiary education at the University of Education, Winneba, where he pursued a four-year Bachler of Arts degree programme in Social Science Education, with political science and history being his major and minor areas respectively. Obed is currently pursuing a two-year master of philosophy programme in Human Rights, Conflicts and Peace Studies at the University of Education, Winneba. 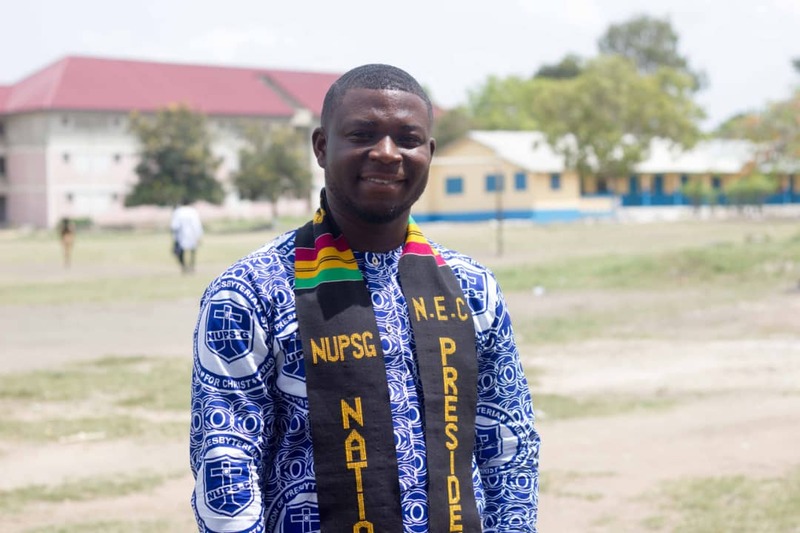 Obed has contributed his part to the growth of NUPS-G as the General Secretary of the Breman Asikuma Senior High Local (2009-2011), the North Campus coordinator, U.E.W local (2013/2014), Assistant Schools� Coordinator (2014/2015) and the Chairman for the Central Planning Committee of the 7th Biennial Schools� Conference, U.E.W Coordinating branch. 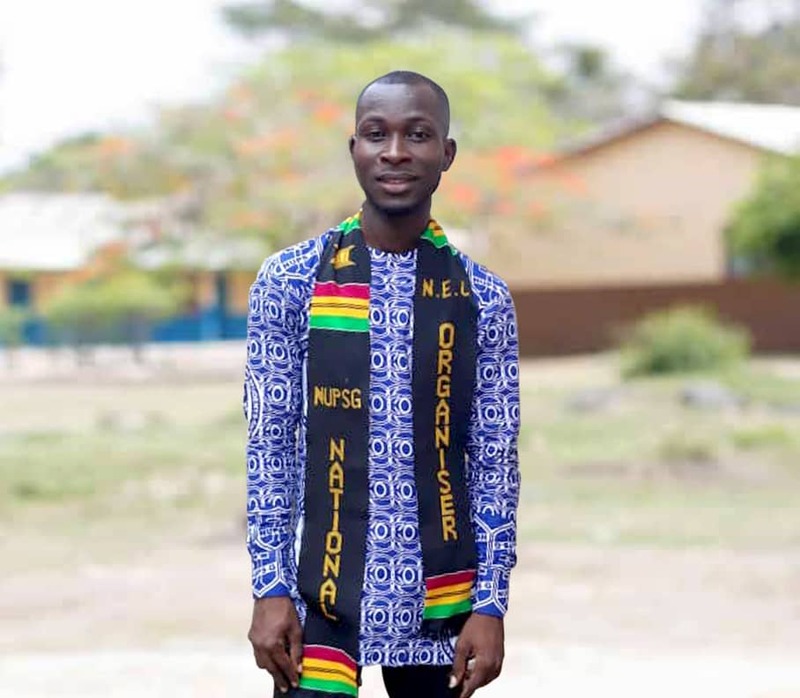 Bernard Owusu grew up in Sunyani in the Bono Region and graduated from the Presbyterian senior high school of Berekum as the Assistant Boys� Prefect for the 2015-year group. He had his Primary and Junior High education at the Methodist Junior High School at Fiapre-Sunyani. He is currently a level 300 student of the University of Education, Winneba and belongs to the department of Early Childhood Education. He was born on the 4th of May, 1997 to Mr. Stephen Owusu and Mr. Vida Afia Owusuaa. 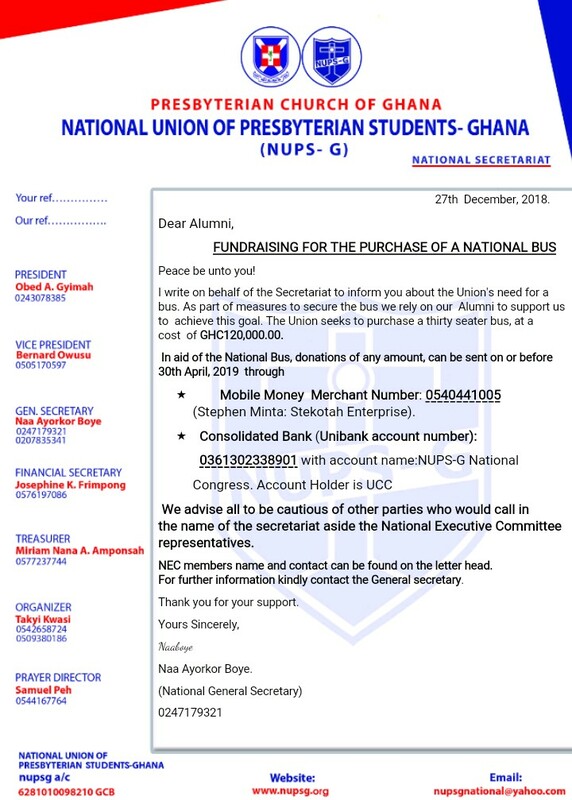 As a Presbyterian, he became a NUPS-G member during his high school education and became the branch President for NUPS-G Berekum PRESEC branch for the 2014/2015-year group. He currently fellowships with Presbyterian church of Ghana, hope congregation � Fiapre. Naa Ayorkor Boye is a level 300 student of the University of Education, Winneba and belongs to the department of Basic Education. She grew up in Accra New Town and is a product of Koforidua Senior High School in the Eastern Region. Naa Ayorkor was born on the 1st of March, 1996. 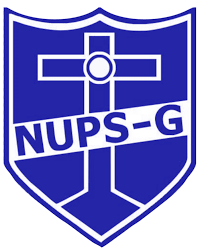 She has been a NUPS-G member since her Senior high school education. She currently fellowships with the Presbyterian church of Ghana at south Abelempke preaching point in Accra. She loves travelling and partaking in evangelism. 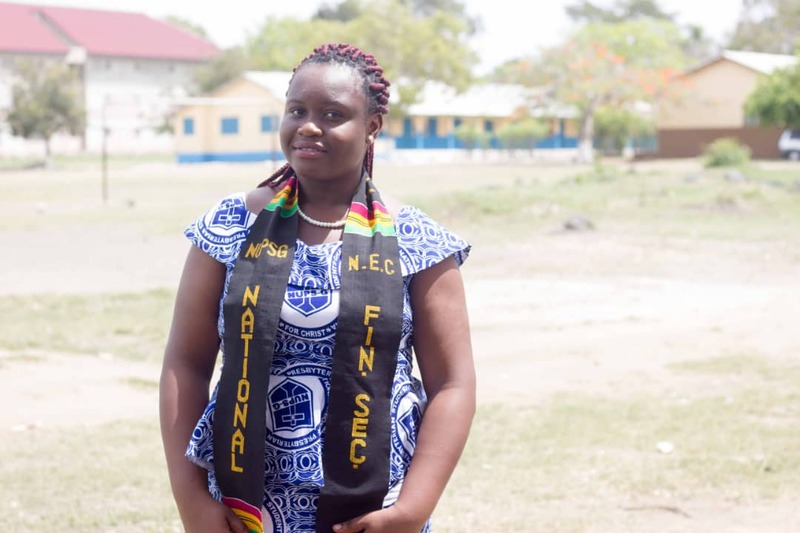 Josephine Kesewaah Frimpong is a level 300 student of the University of Education, Winneba and offers a Bachelor of Business Administration with Accounting option. 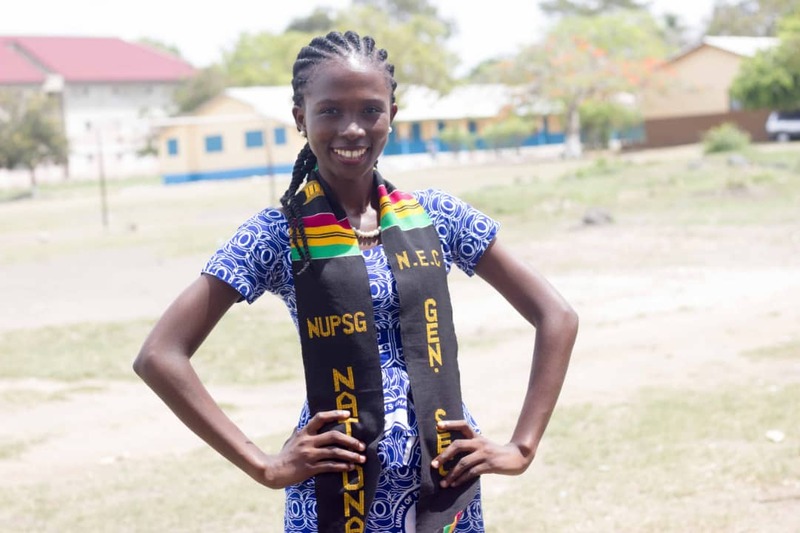 She grew up in Kasoa in the Central region and had her second cycle education at the Winneba Senior High School where she became the Girls Student Chaplain for the 2014/2015-year group. Josephine was born on the 20th of May, 1998. She currently fellowships with Bethel Mountain view Presbyterian Church at Kasoa. Samuel Peh Kwaku is a student of the University of Education, Winneba. He is a third year student of the English Language. He is from Sampa,in the Brono Region of Ghana. He had his Senior High School Education at St. James Seminary Senior High School from 2012 to 2015. He is the last born of Mr. And Mrs., Loppoh. He worships with the Ringwald Memorial Congregation of the Presbyterian Church of Ghana. He enjoys reading and listening to preaching tapes. Takyi Kwasi grew up in Jamasi Kyekyewere in the Ashanti region of Ghana. He attended Kumasi Senior High Technical School (K.S.T. S) and is currently a pursuing a four-year Bachelor of Arts Degree in Art Education with Graphics Design and Leatherwork as major at the University of Education, Winneba. He is a devoted Christian and a member of the Presbyterian Church of Ghana. 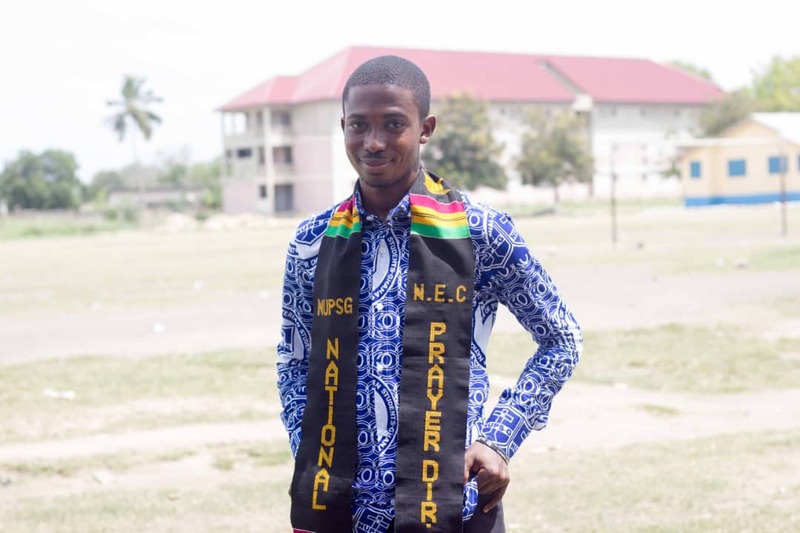 He currently worships with the Trinity Presbyterian Church, Oduom where he is serving as the Young Peoples Guild�s (YPG) male organizer and also he is currently the national organizing secretary of the National Union of Presbyterian Students � Ghana (NUPS-G). Takyi�s interests lie in reading, listening to music, and watching of football.